For some formal occasions such as party, long gown designs should be considered gently. Selecting the best dress design is essential to keep your performance nice. In Goddess style, long gown may give us such a glorious and classy appearance. Just do what we say to you then. We have some long dress designs in Goddess style which can be chosen below. Some celebrities and even ladies from royal family wear this Goddess dresses collection. Well, we sure every lady is also able to wear it as well. However, we should still select the dress based on our shape, personality and budget. Well, back to Goddess dress basic concept. Speaking of Goddess style dress, it must be associated with Greek gown style. Both dress styles are actually similar. Generally, most Greek and Goddess dresses are usually signed by the application of empire waist and sash strap cut. The empire waist becomes the most outstanding characteristic of this classy Goddess gown. It is a kind of waist cut which fit an area under your breast instead of fit your belly area. The skirt area under this empire waist is typically designed loosely. So you don’t have to worry about your big belly since the empire dress can hide it completely. For the strap and sleeve, the long gown designs in Goddess style commonly incorporate wrap over sash. This sash is effectively arranged to cover your shoulders in pretty way as well as common strap or sleeveless strap. Thus, the appearance of the Greek gown is simply different from usual long dress. On the other opportunity, the long gown designs in Goddess style are designed with high neck. Round neck is installed close to your neck with sparkling embellishment attached on it. Additional linen is typically attached on the back side of your shoulders. It looks as if the wearer has wings attached on both shoulders. These additional sashes or cloth are also useful to replace common dress tail. Generally, the Green dress is made of chiffon with unique vertical pleated detail on it. 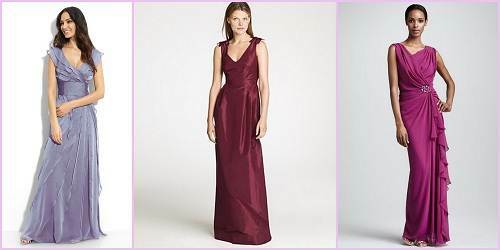 Lately, silk, satin and taffeta are also utilized as the Goddess dress main material.